When I retired from the U.S. Air Force in 1989, I brought back about 200 books from England with me. 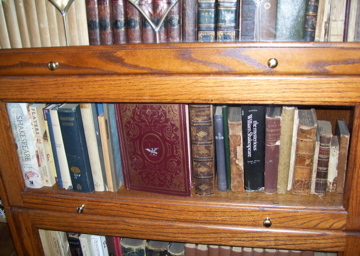 More than a handful of these books were books by or about Shakespeare. I recorded these books in the very first catalogue of my library, citing how much I paid for each book, and the source, with "B" denoting bookstore, "F" denoting book fair, and "A" denoting auction (the average exchange rate in the late 1980s was about $1.50 per £1). Pleasing to the eye is the front cover of Sir Henry Lee's Life of William Shakespeare, displaying Shakespeare's coat of arms, but the cloth on the spine is badly faded. These books that I brought back from England are the cornerstone of my Shakesepare Collection, and have a sentimental value that money can't buy. Take for instance the third book on the list, the Shakespeare book with the first four pages of Intro missing. 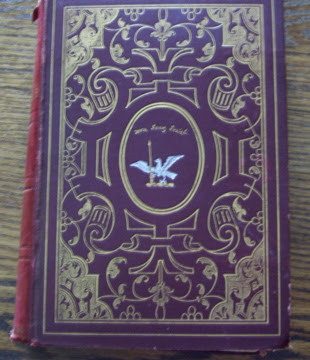 This was my first ever bookbinding project and one of my first Shakespeare books. These Shakespeare books, and their brothers and sisters that I have since acquired, have moved from room to room in our house here in Florida: from the living room, to the master bedroom, to the spare bedroom (converted into a library), to the hallway outside the library, and now to the dining room. Yes, the dining room. It is fitting that Shakespeare has found a home in my new barrister bookcase. I received this barrister bookcase as an early birthday present from my wife. And we celebrate Shakespeare's birthday in April. . . .Well, not everybody celebrated his birthday in April, thanks to the change of calendars . . .
"The fifth of May, making the due allowance of twelve days, the twenty third of April, according to the change of the Style, is the birthday of Shakespeare. Pleasant thoughts must be associated with him in everything. If he is not to be born in April, he must be born in May. Nature will have her with him on her blithest holidays like her favourite lover. . . . 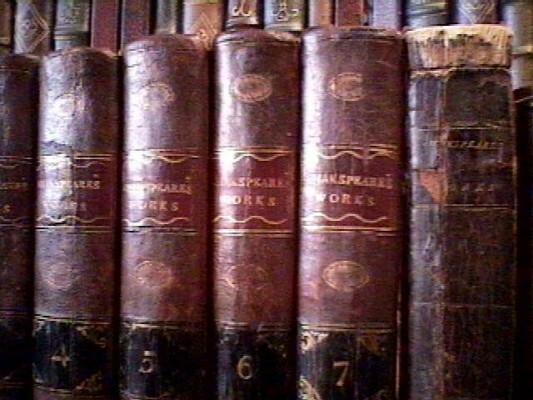 The favorite in my Shakespeare Collection is my married set of the First American Edition of Shakespeare's Works. 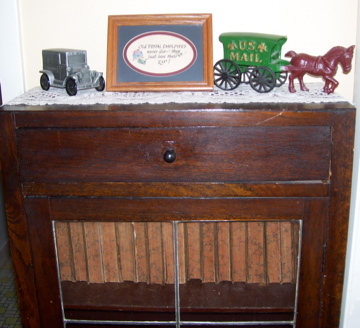 I almost sold this set in 2006 when I was anxiously awaiting approval of my disability retirement application. 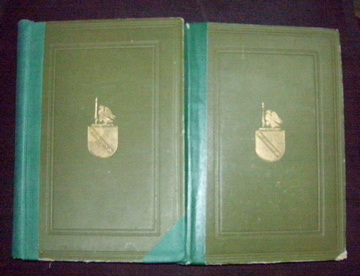 And it is currently on consignment with a notable bookseller SOLD!! It is hard to believe that Shakespeare's works weren't published in America until 1795, yet that statement still holds true today. 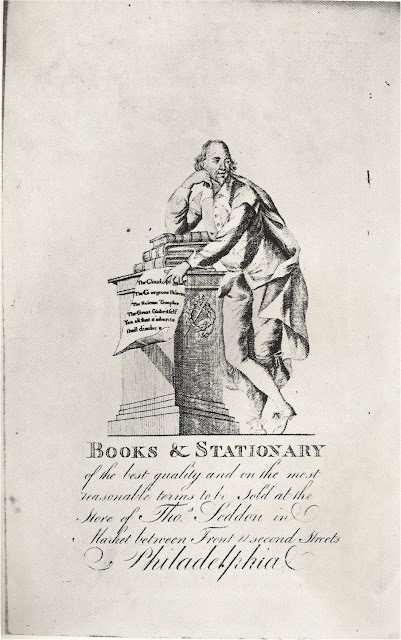 James Trenchard, one of the owners of The Columbian Magazine, engraved the advertisement himself. The advertisement is inserted in the July 1787 issue of the Folger Shakespeare Library copy of The Columbian Magazine, and in the August 1787 issue of the Library Company of Philadelphia copy. It is not in any issue in the Darlington Memorial Library copy at the University of Pittsburgh –– at least I couldn't find it! The Darlington Memorial Library copy can be viewed online at archive.org. Did someone swipe the engraving or was it never inserted in the periodical? I notified Special Collections at the University of Pittsburgh to physically check their copy in storage. 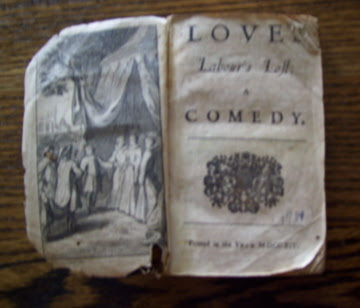 Rosenbach was on target with the date. 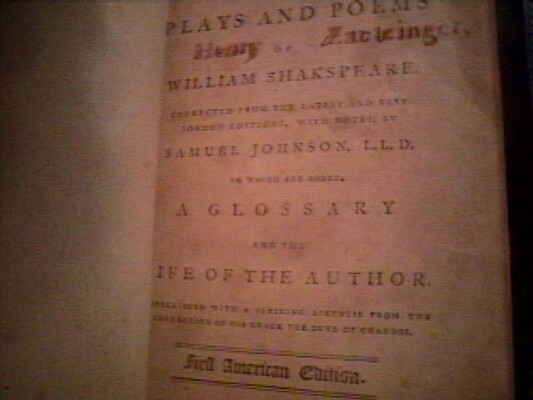 Modern scholars cite 1794 as the date of publication of the Boston edition of this work. S. Hill is Samuel Hill, a Boston engraver who is credited with engraving the portraits on the frontispiece of the Boston edition of Essays on Physiognomy (the word physiognomy means a person's facial features). A London edition of this work published in 1789 didn't have the frontispiece; the portraits were printed individually throughout the book. 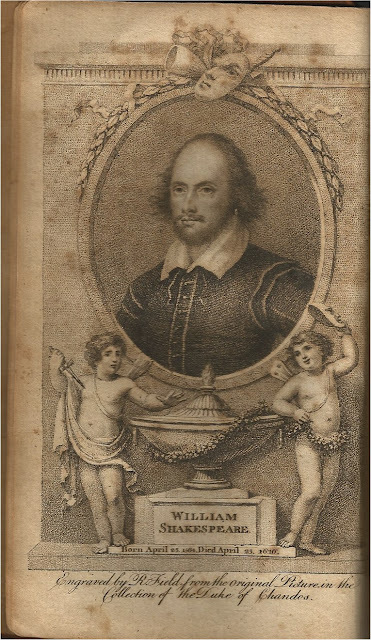 So even if Trenchard's engraving is disqualified from contention as being a mere advertisement, Samuel Hill's engraving would be the winner as the First American Portrait of Shakespeare, and not Field's portrait from the First American Edition of Shakespeare's works. Nicholas Rowe was the first Shakespeare editor to provide an extensive biography of Shakespeare. 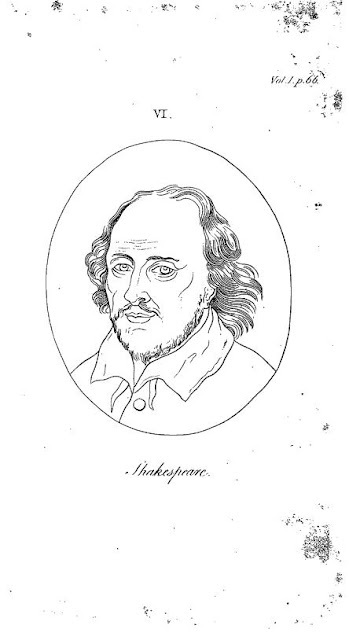 Later editors would disapprove of his edition because the text of Shakespeare's plays is based on the text of the 1685 Fourth Folio and not on text of the First Folio. Not all of my Shakespeare books can be viewed from around the dining room table. 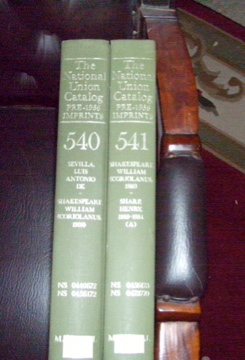 My association copies and gifts from friends are in my library room, as are two large odd volumes of the National Union Catalog, Volumes 540 and 541, covering the works of Shakespeare. These books are too large for my barrister bookcase, as is an oversized volume of Shakespeare I bought when I worked at Waldenbooks in the 1990s. 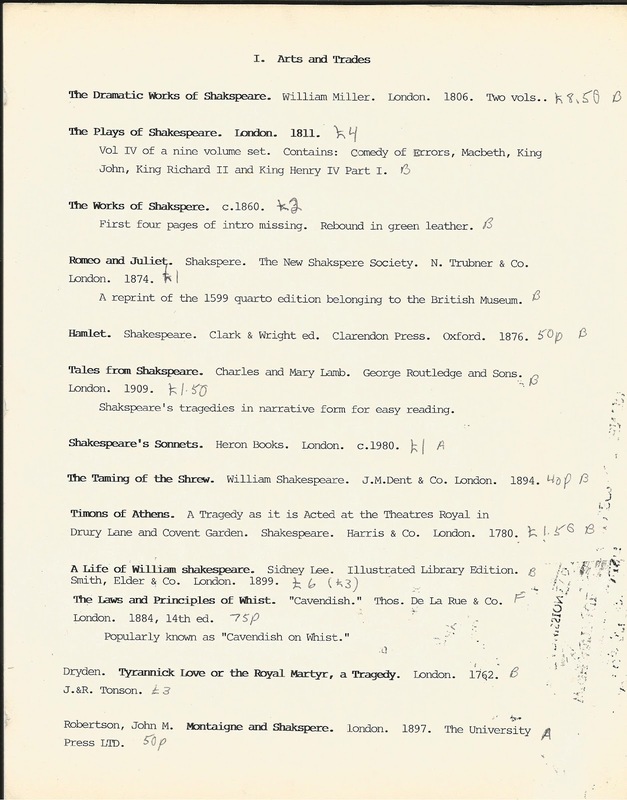 Other recent additions include Shaksperiana: catalogue of all the books, pamphlets &c. relating to Shakspeare, by John Wilson, London, 1827, a gift from Per Rålamb, and Folomania! : stories behind Shakespeare's most important book, by Owen Williams, Washington, 2011, a gift from Paul Ruxin. Thanks guys! 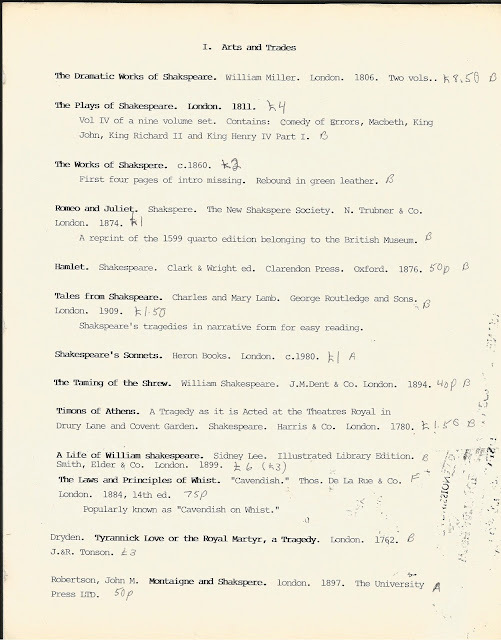 Without much ado, you can view these Shakespeare books and more on Library Thing.